The effectiveness of the user-computer interface has become increasingly important as computer systems have become useful tools for persons not trained in computer science. In fact, the interface is often the most important factor in the success or failure of any computer system. Dealing with the numerous subtly interrelated issues and technical, behavioral, and aesthetic considerations consumes a large and increasing share of development time and a corresponding percentage of the total code for any given application. 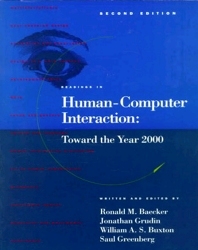 A revision of one of the most successful books on human-computer interaction, this compilation gives students, researchers, and practitioners an overview of the significant concepts and results in the field and a comprehensive guide to the research literature. Like the first edition, this book combines reprints of key research papers and case studies with synthesizing survey material and analysis by the editors. It is significantly reorganized, updated, and enhanced; over 90% of the papers are new. An invaluable resource for systems designers, cognitive scientists, computer scientists, managers, and anyone concerned with the effectiveness of user-computer interfaces, it is also designed for use as a primary or supplementary text for graduate and advanced undergraduate courses in human-computer interaction and interface design.